So, you wanted this year to be different. No more fake tree, right? You just picked out a beautiful REAL Christmas tree, strapped it to the car and got it all set up at the house. Only to find bugs. Lots and lots of bugs. 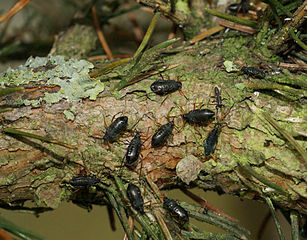 Bet you didn’t know that a Christmas tree can actually contain as many as 25,000 bugs! Well, it’s too late for that little fact to be useful now. We’ll get right to letting you know how to get rid of the aphids and other Christmas tree bugs that have taken over your home. The good news is the insects you are seeing in your house greatly prefer living outside. There is not enough moisture and humidity in your home to sustain these bugs and eventually they will die on their own. To speed up the process, we recommend treating the tree with neem oil. Ideally you would be able to treat the tree before bringing it into the house. If the tree is already set up in the home, we recommend manually removing live insects where possible with a vacuum. If the problem persists, contact a local pest control company. Another safe option to minimize the likelihood of bugs getting into your home from Christmas trees is diatomaceous earth. A light dusting of the tree, preferably before the tree is brought inside, will eliminate the majority of insects hidden within it. A key mistake many people and even professional applicators make is over application of insecticidal powders like diatomaceous earth. If too much is applied it creates clumps of powder insects avoid. The ideal application will leave a light dust residue that insects cross so it contacts their bodies and kills them. Probably the most common insect we see on plants and trees in South Florida. Aphids have pear shaped bodies and can be various colors. They have antennae, and feed through sucking mouthparts called stylets. 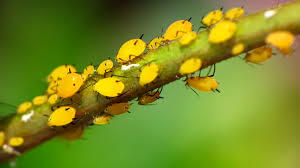 Aphids often feed in dense groups and the adults are wingless. 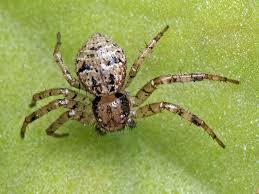 Small spiders can often look like aphids. The most obvious difference is that spiders have eight legs, while aphids only have six. Since spiders eat insects, Christmas trees are the perfect hiding spot for them. If any spiders are found in Christmas trees, they are most likely not dangerous. You most likely won’t even see them. If you see spider webs in your home around this time of year and are not used to seeing them, this is most likely how they got inside. These small insects are oval in shape and are less than a millimeter in body length. If you see many of them on a tree that has not been cut down yet, you may want to rethink your choice of a tree. Since adelgids inject toxins while feeding, the tree is likely stressed and may lose its needles prematurely if it has not lose many already. The good news about adelgids is that they won’t venture away from your Christmas tree if they are brought into your home. They are sedentary and will stay in place on the tree if they are present. Bark beetles like boring into tree trunks, so they are most commonly seen when you are watering your Christmas tree or setting up the base. 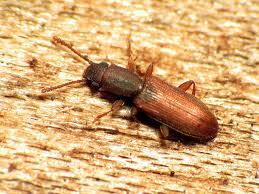 You may notice some small holes in the base of the trunk or sawdust as a result of these beetles. Do not worry about them damaging any wood within the home. Since they require moist wood to survive, they won’t be able to cause any damage. While they can look scary, they don’t bite. It may be hard to see them in the photo, but these are definitely spider mites! Without a magnifying lens, they look like small red dots. Many plants in the landscape around your home probably have spider mites on them. They are often on the undersides of leaves where it is more humid and protected from the elements. 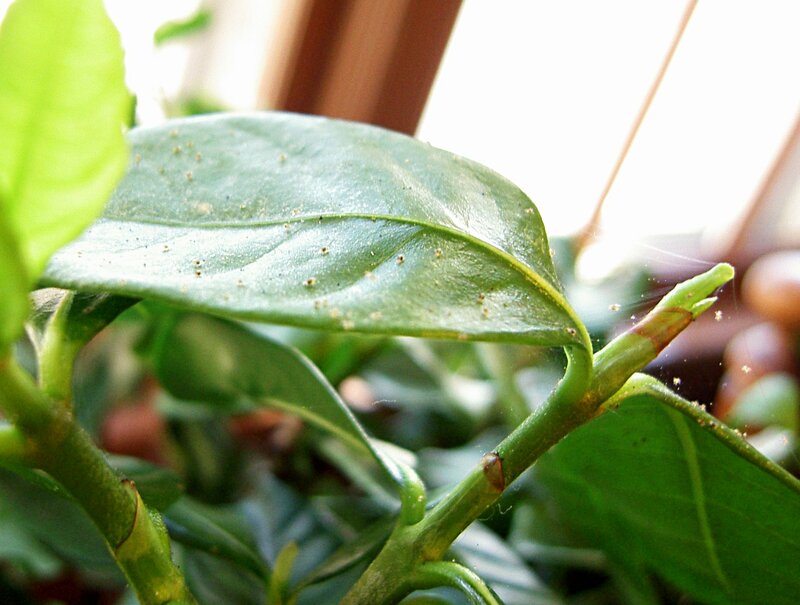 Spider mites are often mistakenly treated with insecticides such as bifenthrin. While the majority of insects are controlled by popular insecticides, they can actually cause spider mite populations to increase. By killing all the beneficial insects that prey on them, there may be no natural predators remaining to keep their population in check. Another Christmas tree bug you may encounter are praying mantises. As predators to many insects, Christmas trees may be considered an insect buffet if they find the right one. If one of these does sneak in your home while hidden in your Christmas tree, it may not be a bad thing! 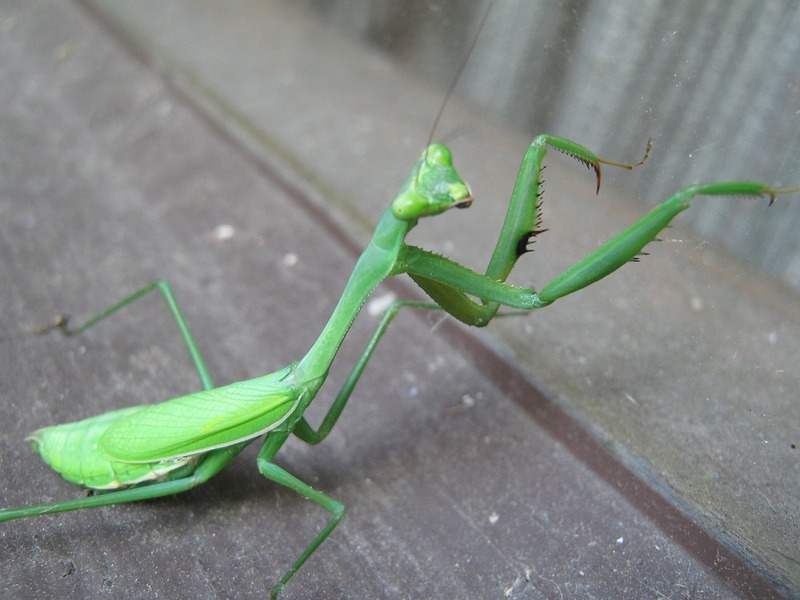 Many people actually keep praying mantises as pets. 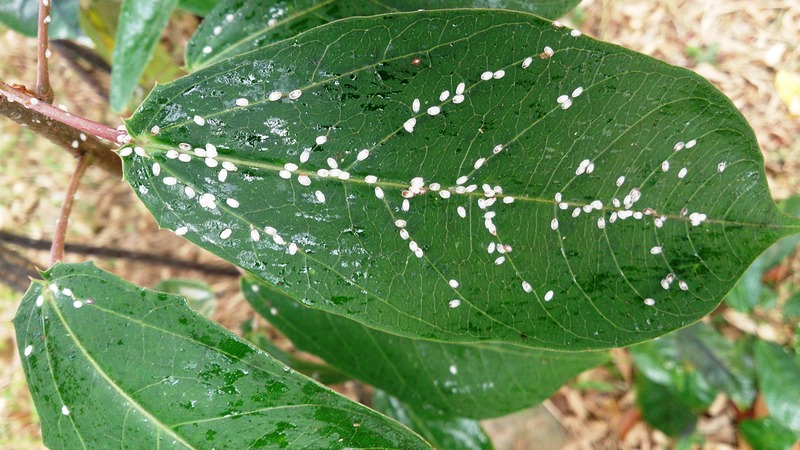 Scale insects are extremely common in most landscapes and nurseries. With their piercing-sucking mouthparts, they remove plant fluids which often results in plant material turning yellow or brown. 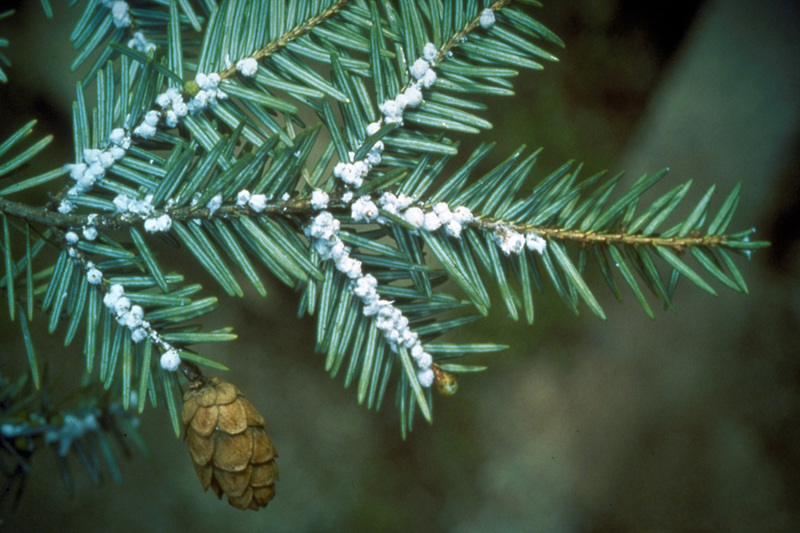 On Christmas trees, pine needle scale may often go unnoticed since they may appear to be a natural part of the needles on the tree.